The death in 1997 of Princess Diana shocked the world, and Britain especially. A hugely popular figure, loved as much for her compassion towards others as for her down to earth, approachable nature, Diana caught the imagination of the public like no other Royal. This unique Memorial to Diana, Princess of Wales was opened by Her Majesty The Queen on 6th July 2004.
and ten thousand competing designs later, two ideas were chosen from which the winning fountain would be selected. The entry of American designers Gustafon Porter won the vote over that of British artist Anish Kapoor. The philosophy behind the Gustafon Porter design was that the fountain should express the concept of 'Reaching out - Letting In', in order to symbolise Diana's inclusiveness and accessibility. The presence of the fountain surrounded by open landscape was intended to create an energy which radiates outwards while at the same time draws people towards it, again reflecting the essential nature of Diana. Design and construction was a ground-breaking feat of engineering bringing skills and technologies together from across Britain and across disciplines. The Ford Motor Company created a 3-D scan file from a scale model of the fountain and surrounding land. They did this using digital scanning technologies and software they more commonly use in the design and manufacture of their vehicles. The software was modified for the task and the results allowed the design team to create sections through the Memorial's granite ring and surrounding landform, these then being used to develop the design of the features in more detail. British firm Surface Development & Engineering (SDE) developed this sectionised scan file into a comprehensive 3-D model, complete with 545 'virtual' granite blocks, detailing even the exact location of each within the site. These virtual blocks were then augmented with work by British company Barron Gould-Texxus (BGT). The fountain design incorporated very complex and varied surface textures in order to produce the variety of water flow required. BGT were tasked with computer modelling these complex surface patterns and incorporating that information into the SDE 3-D model. Once complete, the file was translated into code which Northern Irish stonemasons S. Mc Connell and Sons would be able to use with their hi-tech CNC cutting machines. Meanwhile, 'De Lank' granite was identified as being the most suitable material for the fountain, it being non-porous and possessing a very light colouring which would accentuate the flow and sparkle of the water as it circulates round the structure. A quarry in Cornwall was identified as the best source for this, and once extracted, the stone was shipped to Northen Ireland for work by McConnell and Sons. Preparatory work began on the Hyde park site in 2003, and in August that year Culture Secretary Tessa Jowell MP laid the foundation stone, accompanied by Rosa Monckton. Work was completed in good order and the Princess Diana Memorial Fountain was officially opened on 6th July 2004 by HRH Queen Elizabeth. This was the first time the Windsor and Spencer families had been together publicly since Diana's funeral. From its source, water runs down the fountain in two directions, the east side featuring richly textured steps which the water bounces down before passing under a crossing point to the rock and roll section where it gentle rocks and rolls along a subtle curve. Before entering the reflection pool at the bottom of the fountain, this east-track of water passes through the swoosh - a subtle curve where water jets create patterns in, and pump additional energy into the water. Water which follows the western channel of the fountain ring firstly passes over the highly textured surface of the Mountain Stream where it dances in a lively play of water before passing under a crossing point then onto the bubbles section where the channel widens out and air bubbles are introduced. The water then becomes a tumbling cascade of white water as it corners over a waterfall. Western channel water then spills over the elaborately carved chadder before tumbling into the reflecting pool where it's re-united with water from the eastern channel. The water for the fountain is drawn from London's water table and is continuously refreshed. 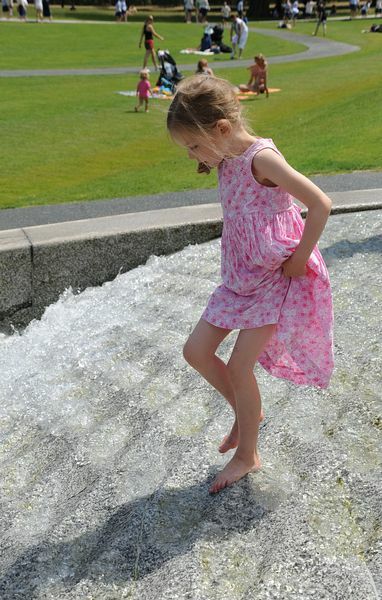 The Princess Diana Memorial Fountain proved to be massively popular with adults and children alike, just like the Princess herself. Such was the demand to interact with the fountain that it had to be closed for a short time just 16 days after it was opened. This was partly following a number of people slipping in the water flow, partly to identify a means of handling the huge demand in a manner which would preserve the site in a sustainable way while allowing appropriate access. The Fountain was re-opened on 20th August 2004 with access to the Fountain itself being actively managed and extra staff being on hand to assist visitors. Since then the Princess Diana Memorial Fountain has continued to delight and enchant visitors of all ages from across the globe, while helping provide a focus for thoughts and memories of the Princess herself, and helping remind people of the unique, compassionate qualities that made her so loved around the world. There are three bridges where visitors can cross the water and go right to the heart of the fountain. Visitors are welcome to sit on the edge of the Memorial and refresh their feet, but are asked not to walk on the Memorial. The Memorial has become one of London's most popular attractions with around one million visitors expected each year. As with any important feature in the Park, planned regular annual maintenance is required. This is scheduled for the second and third weeks of November, as that is the least disruptive time for visitors and the most appropriate time for conducting the horticulture work. The date may be subject to change, if there are adverse weather conditions. It's recommended that visitors avoid coming by car as there are limited places. Pay and Display parking is available on West Carriage Drive and in Car Parks at either end of Serpentine Bridge.